Sandy Hook Elementary School. Marjory Stoneman Douglas High School. Santa Fe High School. These are some of the biggest school shootings that have happened in our country the past few years, but they are only three out of the 288 that have occurred since 2009. This statistic, though, only pertains to shootings happening at schools. When there is not a shooting at school, there are shootings happening outside of it, often killing masses. For instance, Orlando, Las Vegas, and Sutherland Springs. In 2016, Orlando’s gay nightclub, Pulse, was marked as the deadliest mass shooting and terrorist attack since 9/11 with 49 killed. Last year, 2017, concertgoers in Las Vegas were struck by rounds of rapid gunfire, killing 58, and was then dubbed the greatest mass shooting. A month later after Las Vegas, a gunman opened fire on a small church in Sutherland Springs, resulting in 25 fatalities and the death of an unborn child. Disturbing, to say the least. The information and statistics I have been finding throughout my search has been startling, unsettling, and most definitely eye-opening. Although this post is more concerned with Connecticut and its latest news in terms of gun control, a lot of it is intertwined with the nation’s crisis of guns and the abuse of them, as they are one of the leading states on enforcing gun control. Based on a CNN analysis of news reports, there is an average of one school shooting per week. Surprisingly, this fact does not totally shock me, and that is rather concerning. Many in this country, myself included, have become almost desensitized to the weekly news of another shooting episode. These shootings have become the norm, and there is something severely wrong with that. So, what do we, as people of this nation who want our children to go to school safely and be educated without fear, do? Do we implement stricter gun laws? Do we put more focus on treating mental health? Both? I’m not sure I have an answer, or a definite opinion just yet, but I’m not so sure this nation has a remedy for this ongoing disaster. What I do know and believe is that I want to live in a country where schools are once again a safe learning space for teachers and students, where shootings are scarce, and where lives are not taken recklessly and unreasonably. Preparations for the 7th annual SHU Media Exchange are underway. This year’s show, “An Independent Voice,” is all about WSHU and its mission of building a better community through quality radio programing. Students from Sacred Heart’s MACOMM program are so excited to share all the work we’ve put into this event. 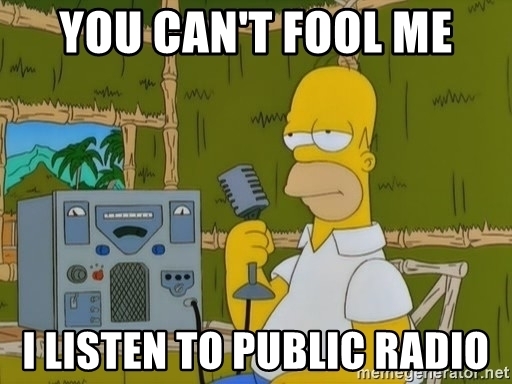 Last year, our show was all about fake news; this year, we’ll concentrate on the importance of public radio and how it gives listeners a clear understanding of the most important news topics. To help us with that, a number of news reporters from WSHU will join our discussion panel, which will once again be moderated by Faith Daniels. When we began working on this year’s Exchange, students broke into groups that largely mirrored the areas of study available in MACOMM. We have outreach students developing web content, digital graphics, and social media content – and that’s in addition to their responsibilities of making sure all of this year’s guests have a great experience. Meanwhile, our production students are developing a set and determining the entire look and feel of the Exchange, down to every camera angle. We have a loaded list of discussion topics for this year’s program that includes: gun control, tolls, marijuana legalization, the education gap, DACA, roads, and, of course, the looming budget crisis. All of these issues have a direct impact on our future and our children’s future. We have such a great group of panelists to help us dive into these important issues. Be sure to follow us on Facebook @SHUexchange, Twitter @SHUMediaXchange and Instagram @shumediaexchange to keep up all of the latest developments heading into this year’s Exchange.